Eclipse is a popular integrated development environment for Java development. Since GeoTools is a Java library we would really like it to work out of the box for you. Our Eclipse Quickstart provides an excellent introduction to setting up eclipse for use with GeoTools covering the M2Eclipse project, command line maven or downloading GeoTools and using the jars in a project. The first time you go to look at any of the GeoTools classes you will need to tell Eclipse where the source code for that jar is. From the “Source not found” editor press the Attach Source… Button. 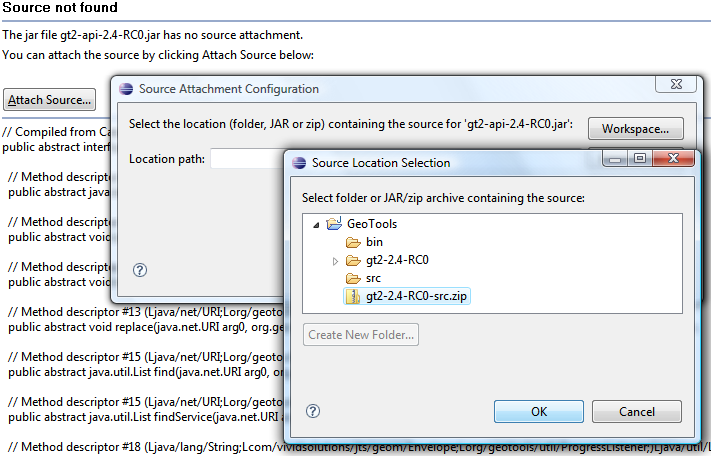 You can quickly cut and paste sourcepath=”gt2-2.4-RC0-src.zip” for the rest of the gt2 jars.